If you're a Satanic metal band, either be eloquent or sell the hell out of the shtick. Sweden's Ghost does the latter on their striking, bizarre debut album. Whether it's Satanic screeds or Christian proselytizing, there are plenty of extreme opinions in metal, but some people deeply devoted to either viewpoint often fail to realize just how overbearing both sides can be. While Christian metal tends to be a bit of a whipping boy in the metal world, many people finding bands' fundamentalist roots very off-putting, the Anti-Christian or Satanic bands don't do themselves any favors either. In fact, for their vehement anti-Christian rhetoric, far too many bands are completely lacking in eloquence, often resorting to cheap, cartoonish gimmicks to provoke pro-Christian audiences. Norwegian stars Dimmu Borgir are a fitting example, their 2007 In Sorte Diaboli rife with boring rants and tacky imagery. Swedish band Watain has also done the same with the often ludicrous lyrical content of 2010's Lawless Darkness, while Kerry King of the legendary Slayer is getting so predictable in his anti-religious shtick that it's getting boring. If you don't like organized religion, show some eloquence when you stick it to the Christian right. If you're into Satanism, extol the positive aspects of your theology rather than reducing yourself to self-parody. The fact is, whether you're Christian, Satanic, or none of the above, if you lack expressiveness you're just stuck preaching to the choir rather than winning new converts. If you do want to preach to your audience, then it's best to follow the example of the great Mercyful Fate and sell the holy hell out of it. Led by the inimitable King Diamond, the Danish band dove headfirst into the whole devil worship shtick and created music so convincing, lyrics so devout, it was absolutely chilling. 26 years after the release of Mercyful Fate's magnum opus Don't Break the Oath, Satanic metal is so common and cliché-ridden that it's difficult to even care about what bands have to say these days. Sure, there are still thought-provoking bands out there, such as England's Caïna and Canada's Weapon, but when it comes to over-the-top Satanic metal, too many bands just don't go over-the-top enough. Swedish sextet Ghost does, though, and what a first impression they make on their debut full-length. Not to be confused with the Japanese psychedelic rock band of the same name (it's a wonder they're even getting away with it), Ghost immerse themselves in the gimmick completely, both visually and musically. Live, they're a striking sight: five robed, hooded, anonymous musicians churning away, the similarly nameless, face-painted singer garishly adorned in vestments and miter, clutching a chain thurible filled with burning incense. He's a beelzebubian bishop, a pagan pontiff. It might look corny, but there's no wink, no sense of irony. Rather than trying to look evil, his face is dead serious. He has stuff to say, and he means every word. 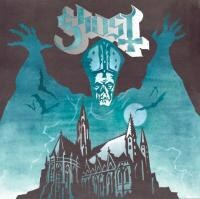 That's all well and good, but in the end it's the music on Opus Eponymous that wins us over. Stubbornly rooted in 1978, it's as if the last three decades of heavy metal history never existed in the minds of these six musicians. As a result, their style of metal is relatively simple, as Ghost mines the early sounds of Black Sabbath, Pentagram, and Judas Priest, as well as the progressive and psychedelic rock of the late '60s, especially Coven's album Witchcraft Destroys Minds and Reaps Souls. A ferocious bassline drives the dark "Con Clavi Con Dio". The devotional lyrics are simple yet effective: "Sathanas / We are one / Out of three / Trinity." Elizabeth Bathory has been a tried-and-true song topic throughout heavy metal history, and the appropriately titled "Elizabeth" boasts an intense gallop, funereal organ, and theatrical, falsetto vocals clearly inspired by King Diamond. Frenetic hammer-ons and atonal organ accents make "Stand By Him" all the more imposing, while "Death Knell" and the lively "Ritual" are so hook-oriented that they practically steer clear of heavy metal altogether, which only heightens the unsettling nature of this band. Opus Eponymous is an extraordinary debut that slowly peels back surprise after surprise as you delve into its 35 minutes of music. Sure, the style is old-school, but it's musically very rich, often more subtle than riff-oriented, and as closing instrumental "Genesis" proves, capable of moments of disarming beauty. Most effective, though, is the way the band gets their Satanic messages across by roping listeners in with accessible arrangements rather than cheap shock tactics. Some bands might like to act "scary" by wearing filthy outfits, sporting corpsepaint, performing alongside impaled sheeps' heads, and splashing buckets of real blood on their fans, but just like how Rosemary's Baby is so much more frightening than Saw, Ghost's comparatively understated method proves to be far more effective, not to mention creepy as hell.